One of the most memorable lines (among many) in Woody Allen's classic Annie Hall sees Alvy Singer opine to the eponymous Annie: "A relationship, I think, is like a shark. You know? It has to constantly move forward or it dies. And I think what we got on our hands is a dead shark." Events of the past 18 months suggested that the Aussie beer world may have its own dead shark too. A pair of mates had embarked on a mission to open Shark Island Brewing Company in Sydney that would have its first beers ready for launch at last year's Sydney Craft Beer Week. They had found a location, sorted branding, designed beers and paid several thousands towards the gear they needed to set up their own small microbrewery in Kirrawee. And it was the last of these – the gear – that led to a situation in which their plans, like Alvy and Annie's relationship, was going nowhere. They were one of the businesses that signed up to buy from the equipment supplier we reported on last month that took tens of thousands of dollars from small businesses across Australia and failed to deliver. Thus the October 2014 launch date was missed and the pair, Dion "Driza" Dickinson and James Peebles (pictured above in grey shirt), who had given up work to focus on the brewery they didn't have, were pouring money into a rented warehouse that lay empty. But, when news broke of the extent of the impact of the failed supplier, things began moving forward again. 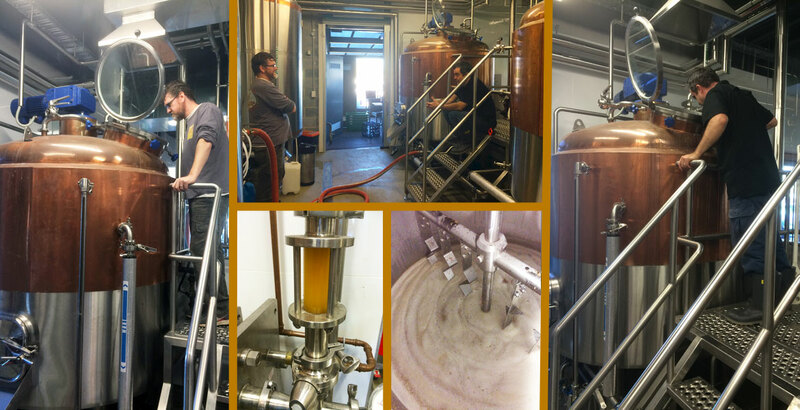 They took part in the charity collaboration brew day at Temple earlier this month that featured other affected breweries and arranged to finally brew their first beers with the team at Blackrock Brasserie / Blackhorse Brewhouse, which is based near the intended location of Shark Island. "Lance Cochrane, of Blackrock, our neighbour brewery in the Shire, which has been running for over a year now, got in contact with us after the article on The Crafty Pint came out with the offer of some assistance to help us get producing and to rebuild our capital," says Driza, a home brewer of 20 years who had worked in various roles in the beer world, including at 4 Pines, before embarking on Shark Island. "It was a generous lifeline that emphasises the camaraderie of the brewing industry." Thus James, who formerly ran the Hopping Mad brewery in Orange before returning with his young family to Sydney and working variously for Vintage Cellars, Balmain Brewing and Icon, joined Blackrock's new head brewer Gerard Meares (pictured in black shirt) for the brew day last week. The first brew is the beer they see as their "gateway" release, the El Mono Bolas Kolsch that features Kazbek hops, a new Czech variety recommended by Gerard. 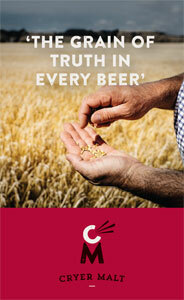 "As James and Gerard have worked together at Icon, the brew day was both smooth and professional," says Driza. "No brew is without its challenges but the two brewers were able to put their heads together to produce a tasty ale." As for the brewery's name and location, which will be just a hop and a skip from where this batch was brewed, he says: "As we had both lived and worked in and around the Sutherland Shire for much of our adult lives it was important to us to attempt to set up our brewery in our local area. Although my girth may hide the fact, I was a keen grommet back in the day and you could find me at the beaches of Cronulla both before and after school on any given day. "Shark Island is a reef break off South Cronulla beach that has a reputation for being slightly dangerous whilst producing some cracking surf. We felt it was a good reflection of the type of ales we aimed to produce. We will have smooth, gateway, summer style ales along with more flavour intense, edgy beers on offer." The first beer will be launched at the Royal Albert on June 4, while the pair are working hard now at finalising plans for their own place, albeit with no hope of seeing the equipment they've paid for or their deposit again. "The likelihood of getting our deposit back is virtually zero. The business has ceased trading and its owner has returned to California. There are several legal cases against him so the likelihood of him returning to Australia to face them is slim," says Driza. "I did receive an email from [the business owner] a few days after the collaboration brew day at Temple saying we will have our money back soon and he was working hard to make it happen but, sadly, I've heard that song several times now and for some months. We have lost $15,000 on the deposit, plus $20,000 in rent waiting for the equipment to arrive. As demand has risen and the Australian dollar has dropped since we last ordered our equipment, we will be paying approximately 25 percent more now for equivalent gear plus there would be another $10,000 worth of rent waiting for the gear to arrive." Despite this, the spirit remains high, with the collaboration brew day at Temple described as "cathartic" and helping bring a positive from the situation. We'll have news on the Eastern Coast IPA when it's ready for release. As for their hosts for the brew day, things are on the up too. Since Gerard has come on board, he's reworked some of the existing beers and released a Porter based on a beer that previously won a trophy at the Australian International Beer Awards. They're looking for a sales rep and have a pilsner (another style Gerard has won a trophy for in the past) coming too. "We have been chatting with Driza and James for some time now," says Blackrock owner Lance of their offer to help. "They have been big supporters of us and I wanted to return the favour. "By helping them get up and going I'm also hoping we can work together to give the local southern Sydney craft beer scene a really big push. There is still a lot of room for growth in the current beer environment, and working together with these boys can provide positive outcomes for the both of us." All being well, The Shire should be welcoming its second microbrewery by September this year. "You will see our ales in the market from early June and a tasting room added to their Blackhorse Brewhouse hopefully by September 2015," says Driza. "The best piece of advice I received from [co-owner] Jaron Mitchell at 4 Pines was 'There's no right or wrong way to build a brewery'. We've almost proved him wrong with our errors – sorry, boss! – but we can say we have learned plenty from the past 12 months. "We were looking hamstrung with no real answer to the question of when we'd open our brewery a few weeks back. [Now that] Blackrock have offered us an unbelievably generous proposition to gypsy brew out of their pilot brewery in Kirrawee whilst contracting out of Sylvania, it enables us to focus on getting some product out at last, which provides us some breathing space to build our brand and rebuild some capital to get independently operational within the next 12 months." All of which, to paraphrase another of the characters in Annie Hall, is "transplendent".